Condusiv Technologies is the world leader in software-only storage performance solutions for virtual and physical server environments, enabling systems to process more data in less time for faster application performance. Condusiv guarantees to solve the toughest application performance challenges with faster than new performance via V-locity for virtual servers or Diskeeper for physical servers or PCs. With over 100 million licenses sold, Condusiv solutions are used by 90% of the Fortune 1000 and almost three-quarters of the Forbes Global 100 to increase business productivity and reduce datacenter costs while extending the life of existing hardware. Condusiv’s Diskeeper® 16 with DRAM caching guarantees to fix worst performing physical servers or PCs with faster than new performance. Instead of “defragging,” Diskeeper 16’s newest patented engine ensures large, clean contiguous writes from Windows so fragmentation is no longer an issue for HDDs or SSDs. This eliminates the “death by a thousand cuts” scenario of small, tiny writes that inflates I/Os per second, robs throughput, and shortens the lifespan of HDDs and SSDs alike. Diskeeper 16 electrifies Windows system performance to operate faster than new with the addition of dynamic memory caching - using idle DRAM to serve hot reads without creating an issue of memory starvation or resource contention. 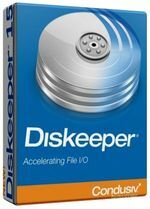 Condusiv's Diskeeper® 16 Professional with DRAM caching guarantees to boost Windows laptops and workstations with faster than new performance, or your money back for 90-days – no questions asked. Instead of “defragging,” Diskeeper 16’s newest patented engine ensures large, clean contiguous writes from Windows so fragmentation is no longer an issue for HDDs or SSDs. This eliminates the “death by a thousand cuts” scenario of many, tiny writes and reads that slow system performance and shortens the lifespan of HDDs and SSDs alike. Diskeeper 16 electrifies Windows system performance to operate faster than new with the addition of dynamic memory caching – using idle DRAM to serve hot reads without creating an issue of memory starvation or resource contention. Where typical defragmentation utilities consume resources to operate and deal with fragmentation only after the performance penalty has already been incurred, Diskeeper 16 is the only proactive solution that solves the problem in real-time while running transparently in the background, eliminating fragmentation issues from occurring on HDDs and SSDs. Diskeeper 16 boosts performance faster than new with DRAM caching. The real genius in Diskeeper’s newest engines is that nothing has to be allocated for cache. Diskeeper dynamically uses only what is available at any given moment and throttles according to the need of the application. If memory is under provisioned and the application asks for all the memory, the caching engine throttles back entirely. However, with as little of 4GB of available DRAM, PC Mark scores reveal a 73% boost in the Microsoft Office Productivity test and a 31% boost in the storage bandwidth test. The new dashboard reporting shows the actual “time saved” benefit on every system so the value is easily quantifiable and never in question. Condusiv’s Diskeeper® 16 Server with DRAM caching guarantees to solve the toughest performance problems on physical servers with faster than new performance, or your money back for 90-days – no questions asked. Instead of “defragging,” Diskeeper 16’s newest patented engine ensures large, clean contiguous writes from Windows so fragmentation is no longer an issue for HDDs or SSDs. This eliminates the “death by a thousand cuts” scenario of many, tiny writes that inflates I/Os per second, robs throughput, and shortens the lifespan of HDDs and SSDs alike. Diskeeper 16 electrifies Windows system performance to operate faster than new with the addition of dynamic memory caching – using idle DRAM to serve hot reads without creating an issue of memory starvation or resource contention. Where typical defragmentation utilities consume resources to operate and deal with fragmentation only after the performance penalty has already been incurred, Diskeeper 16 is the only proactive solution that solves the problem in real-time while running transparently in the background, eliminating fragmentation issues from occurring on HDDs, SSDs, and SAN storage systems while also eliminating the IOPS inflation from many small writes and reads. Diskeeper 16 boosts performance faster than new with DRAM caching. The real genius in Diskeeper’s newest engines is that nothing has to be allocated for cache. Diskeeper dynamically uses only what is available at any given moment and throttles according to the need of the application. If memory is under provisioned and the application asks for all the memory, the caching engine throttles back entirely. However, with as little of 3GB of available DRAM, latency is reduced by an average of 40% on production workloads. Diskeeper® 16 Administrator saves you time and money by providing complete centralized management of Diskeeper operations for all physical servers and PCs on your network, including installation, configuration, monitoring, updating, email reports, alerts and more. With simplified, "policy-based" management of clients in existing or newly-defined groups, you can handle the problems of file system performance across your entire site without ever leaving your desk! The new dashboard reporting shows the actual “time saved” benefit on every system so the value is easily quantifiable and never in question. Diskeeper 16 Administrator makes deploying and managing Diskeeper on even the largest sites very simple. All computers suffer from file fragmentation and need Diskeeper; but with hundreds or thousands of workstations or physical servers on a network, trying to install and configure each one individually would be a time-consuming task. Keeping track of all of them would be nearly impossible otherwise. Diskeeper 16 Administrator edition saves you time and money by providing complete centralized management of Diskeeper operations for all machines on your network, including installation, configuration, monitoring, updating, email reports, alerts and more. Diskeeper 16 Administrator utilizes the Microsoft® .NET framework, and can store data on an existing SQL server® or SQL Express database on any workstation. Diskeeper 16 Administrator makes it easy for you to keep your servers and workstations automatically set to maintain peak performance and efficiency every minute of every day.